It’s time for my entry to Friday Fictioneers, hosted by Rochelle. This week’s photo prompt is by Jean L. Hays. I was going to do a dialogue based on all the “no parking” signs but ended up doing some even sillier dialogue concentrating on the banner which sort of says “Unthink”. I know it’s slightly bad form to write “500” rather than “five hundred” but I was having word count issues :-). Read all the other contributions by clicking on the blue froggy. “UnThink Memory Wipes” – only 500 bucks, and if ever there was a year Bob wanted to forget, this was it. Presently Bob emerged looking confused, the last year erased. Bob paid up (again) and left. “You stood too close to the machine again, huh?” asked the receptionist. “What machine?” asked the technician. You know me well :-). That banner definitely looked like it was begging for someone to write a story about it. I’m glad you liked the story even if you didn’t make a big wad of cash out of it! I’m aware of it but not sure if I ever read it. I’ll have to track down a copy, thanks! PKD is one of my favorite authors. I think you’ll like it. The short story is called, We Can Remember it for you Wholesale, I believe. Can I get one of those? It wouldn’t solve my problems, but they wouldn’t bother me because I wouldn’t remember them. Ah, but they’d probably still be there waiting to leap out at you. I expect Bob will discover that soon enough! I think I can send you even MORE customers. Such fun! I saw the UNTHINK sign but COULDN’T THINK of a story about it. You’ve done a stellar job. Something about a… um… oh. Ha! Good one, whoever you are. Good one what? Who’s this? Who am I? Such a fun story and very imaginative! I loved it. I’m glad you liked it! I saw the banner and thought it was just begging for a story. 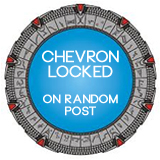 Flashes to “Men in Black” … where did I leave my neuralizer? Darling Hubby also makes an excellent and effective shooter called the “Mind Eraser.” Thanks for the grins. You’re welcome for the grins 🙂 At least the neuralizer was free! That was great (bump)…what am I doing here. Not a clue how your mind works. Never would I waste $500 on anything I didn’t control or couldn’t eat. Maybe you did spend $500 on a memory wipe and now you’ve forgotten. Noooo, I love wattling in my misery. This Friday Fictioneers thing is pretty cool. I think you should write one of these every week! Oh, sorry, I haven’t even introduced myself, I’m Evil Squirrel! Nice blog you have here Mr. Draliman! I’m aware that it’s a road and something about “getting your kicks on route 66” but that’s the limit of my knowledge on the subject. So I concentrated on the banner instead! I’ll have to take a look at Google maps and see where it goes. 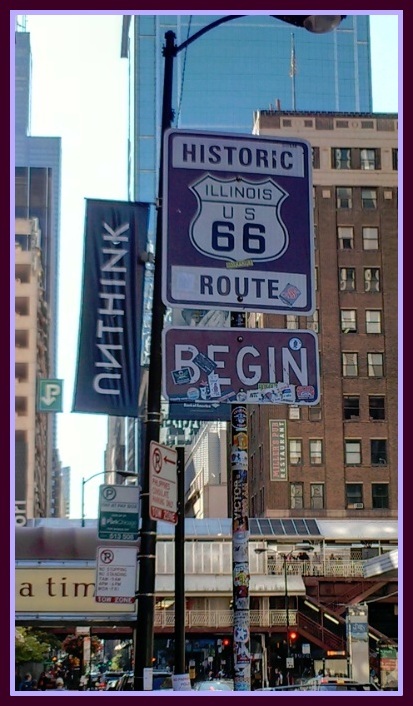 Route 66 technically doesn’t exist anymore, but it is a fabled part of 20th Century America, thus the “historic” signs. There are two breaks in the old Route 66 just near me… one of which is the bridge that goes from Illinois into Missouri. It shut down in the 70’s, and was recently turned into a walking trail. Thanks. I bet a few people still follow the route it took, just for the adventure! What a great story. That ‘Unthink’ sign was just begging to become a story, and you’ve done it justice, and then some. Great fun. You have an amazing sense of humor. Mix that with Sci Fi and you have your cash cow. I can hardly type for laughing. Great story. Excellent, whimsical and humorous. Who could ask for more. I loved your story for its simplicity and imagination. Even the invention of Memory Wipes was inspired. Very well done. I’m so glad you enjoyed it. I seem to be on a “humour kick” at the moment! Great story! Also now I just have to read the PKD original as mentioned by your commenter. Thanks! I need to read it too. Having seen two versions of Total Recall, it would be nice to read the inspiration. I’m cracking up over here…I will find a way to use the phrase ‘memory wipe’ in future situations. Good fun. Gave me a good laugh. I’m glad you focused on the UNTHINK sign, Great story with a lot of humour but also a scary thought that such a machine would be in the hands of such a man. Still, I can’t help but admire his enterprising spirit. Maybe those who buy into it get what they deserve! It doesn’t sound like the safest of machines to subject oneself to, does it? Glad you liked my story! I’m sure sooner or later he’ll wander too close to the machine himself. Or the technician will twig that something’s afoot and take matters into his own hands (if he ever remembers who he is!). Who’s on first? Hu? What? Where? Very clever, Draliman! so interesting – Route 66 is conventionally experienced from East to West, mimicking the countless California-bound travelers that headed that-a-way way before. But for nonconformists heading West to East on Route 66, this battered brown sign in downtown Chicago marks the end of the road. And if their rebellion is spent, they can drive a block north to the “Begin Route 66” sign and start chasing sunsets. I think I’d rather do it the “conventional” way and finish my journey in the warmth and sunshine! This had a CLASSIC comedy feel to it. Well done, darling. One of your best. It’s the perfect scam when you can’t even remember where your money went! Oh my, I laughed out loud! What a great story. Ha.. very clever and fun .. I think.. I might have forgotten.. where do I pay? You pay just over here sir, 500 dollars. Heh heh.